Again, so soon, we learn of the death of a dear polar bear. 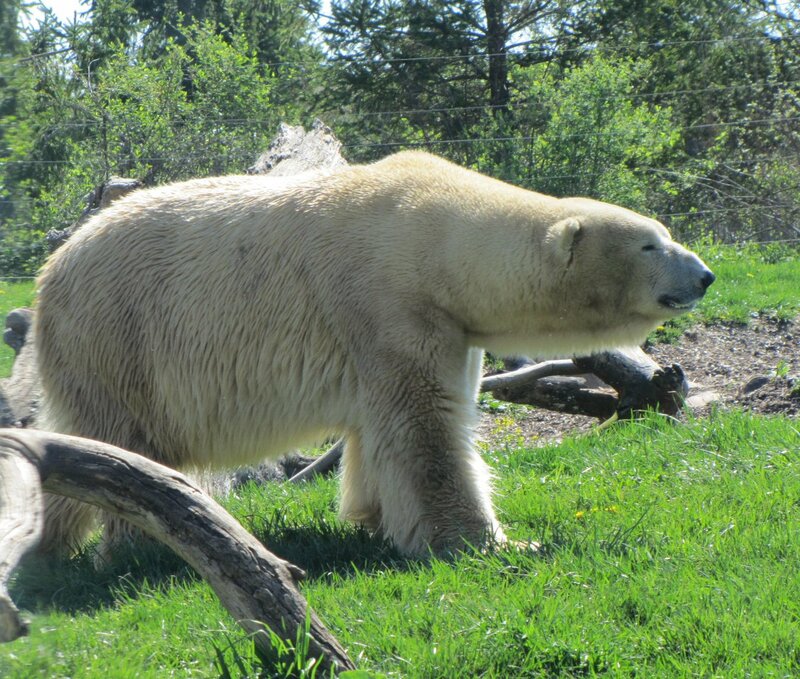 29 year old Nanuq, a wildborn guy who lived at the Henry Vilas Zoo, the Buffalo Zoo and finally the Columbus Zoo, has died of liver cancer. Und wieder einmal, erfahren wir vom Tod eines weiteren beliebten Eisbären. Der 29 Jahre alte Nanuq, in der Wildnis geboren und aufgewachsen im Henry Vilas Zoo, dem Buffalo Zoo und schließlich dem Columbus Zoo, er starb an Leberkrebs. We had heard he was unwell, but zoo staff said said it was allergies, or arthritis, and he was being treated and feeling better. Uns war bekannt, dass es ihm nicht gut ging, aber die Tierpfleger vermuteten Allergien, oder auch Arthritis, und er wurde auch behandelt, es schien ihm besser zu gehen. He trusted the zoo staff so much that they could give him eyedrops, and medicine under his tongue. They could monitor his health closely, and he had been improving, but recently took a turn for the worse. It was as the zoo staff had expected, liver cancer, and Nanuq was let go from his pain this morning. Er vertraute den Pflegern so sehr, dass es möglich war ihm Augentropfen zu verabreichen und ihm Medizin unter die Zunge zu legen. Man hat seine Gesundheit genauest verfolgt, und es ging ihm auch wirklich besser, aber dann kam ein herber Rückschlag. Es war, wie von den Tierpfleger schon vermutet worden war doch Leberkrebs, und Nanuq wurde an diesem Morgen von seinem Leiden erlöst. 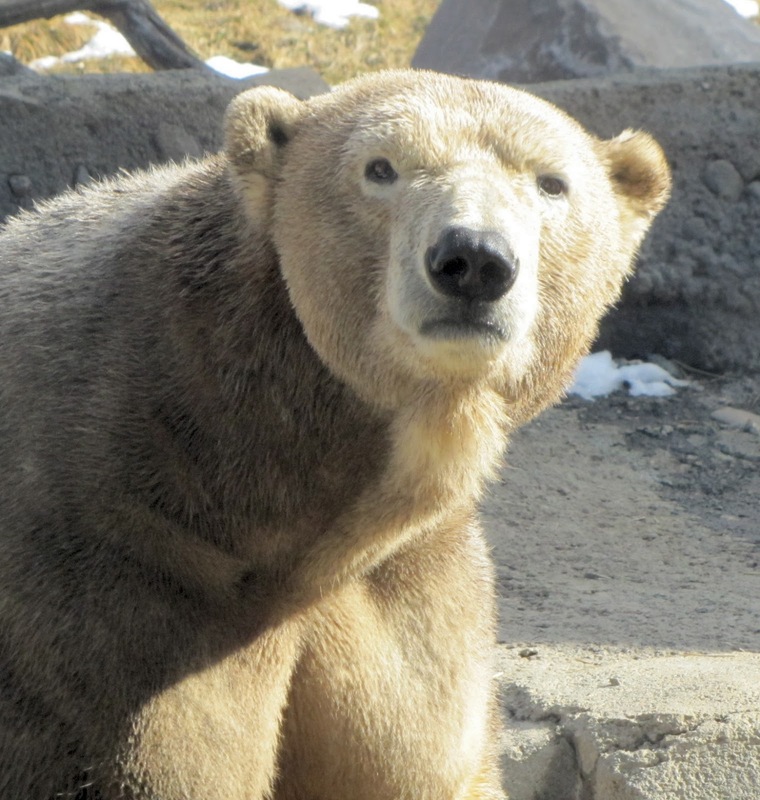 He had been rescued as an orphaned cub in April of 1988 in Alaska, and lived at the Henry Vilas Zoo in Wisconsin until 2009, when he moved to the Buffalo Zoo. 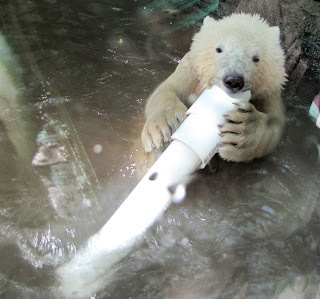 Als Jungtier war er im April 1988 als Waise in Alaska gefunden worden und lebte im Henry Vilas Zoo in Wisconsin bis 2009, dann wurde er in den Zoo von Buffalo verlegt. 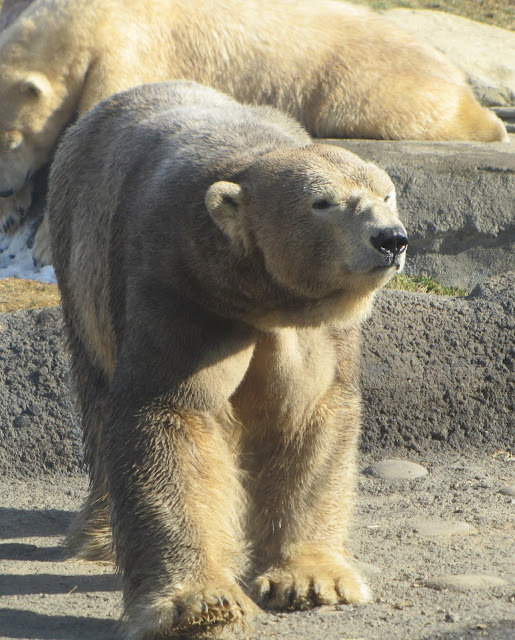 Luna of the Buffalo Zoo. 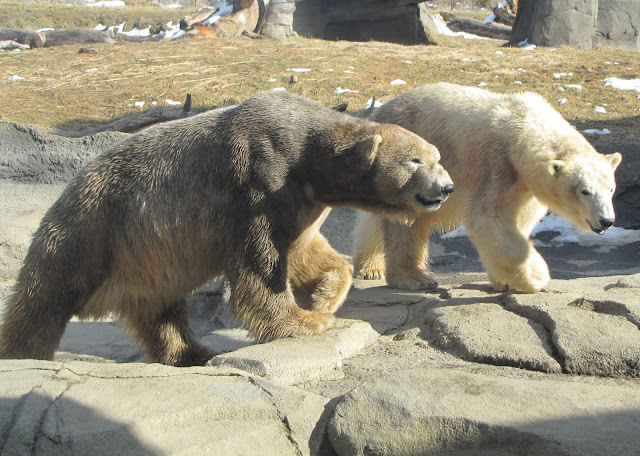 There he fathered a cub, Luna, in 2012 with Anana (now at the Cincinnati Zoo). 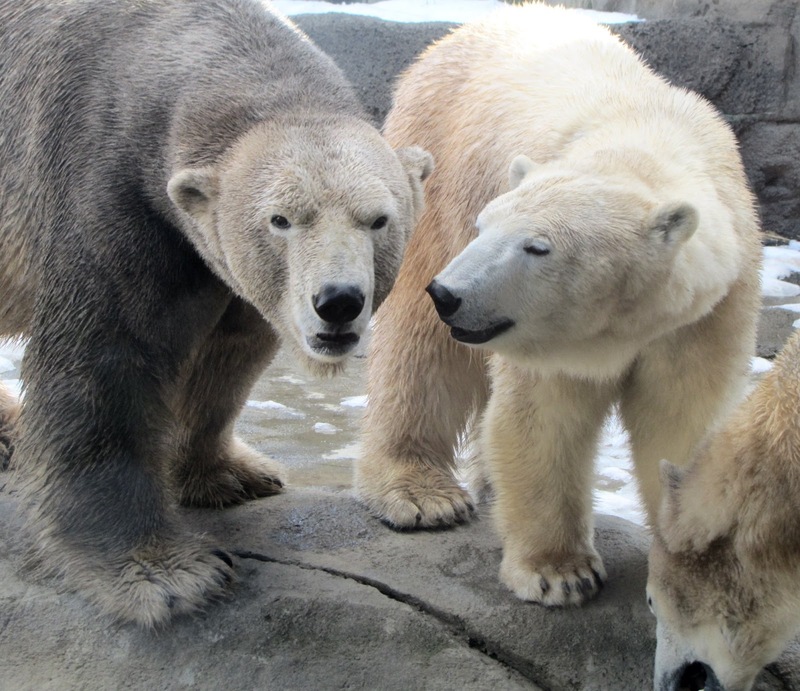 Before Luna was even born, he moved to the Columbus Zoo where he met twins Anana and Aurora. Er zeugte ein Jungtier namens Luna 2012 mit der Mutter Anana (jetzt im Cincinatti Zoo). Bevor dann auf der Welt war kam er in den Columbus Zoo und traf dort auf die Zwillingsschwestern Anana und Aurora. He was very popular with Aurora and Anana in Columbus. He especially liked Anana, but all three got along very well. Er war dort recht beliebt bei Aurora und Anana im Columbus Zoo. Besonders war er von Anana angetan, aber alle drei kamen sehr gut miteinander aus. 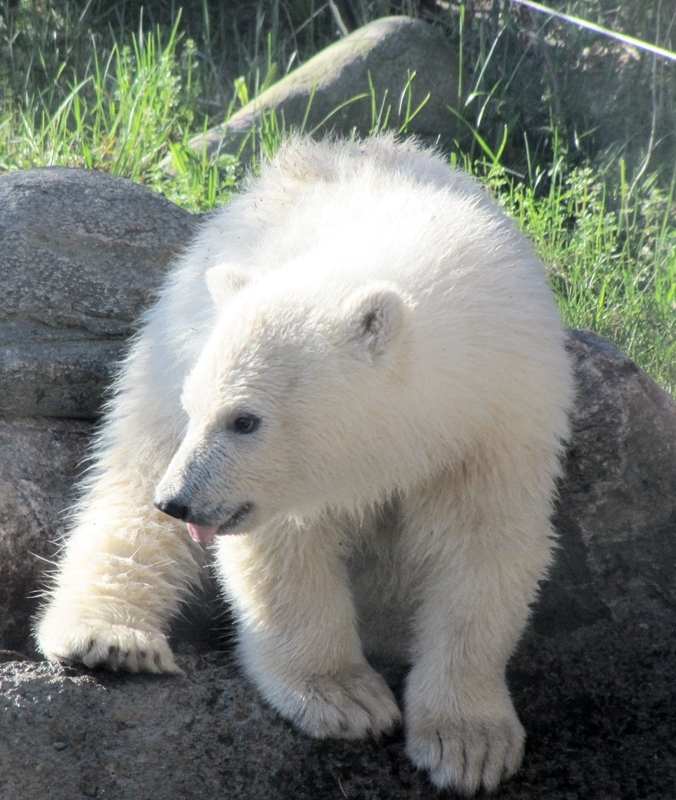 Nanuq's daughter Nora was born to Aurora in November of 2015, and became an international sensation as a hand-raised cub. 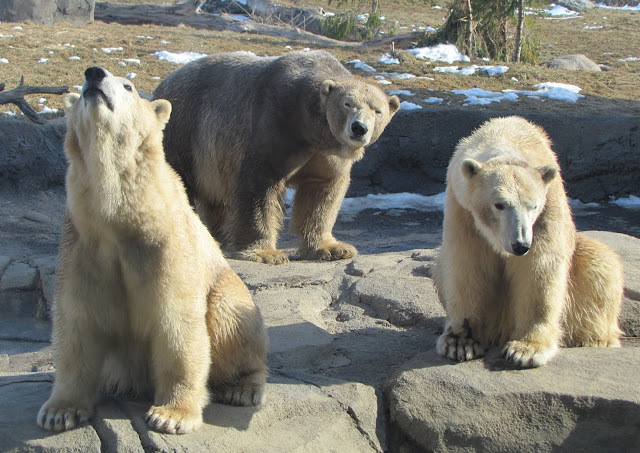 This past November both Aurora and Anana gave birth to cubs, so now there are three little ones in Columbus, the only cubs born in a North American zoo this year. Nanuqs Tochter Nora wurde von Aurora zur Welt gebracht im November 2015, und sie wurde international berühmt als eine Handaufzucht. 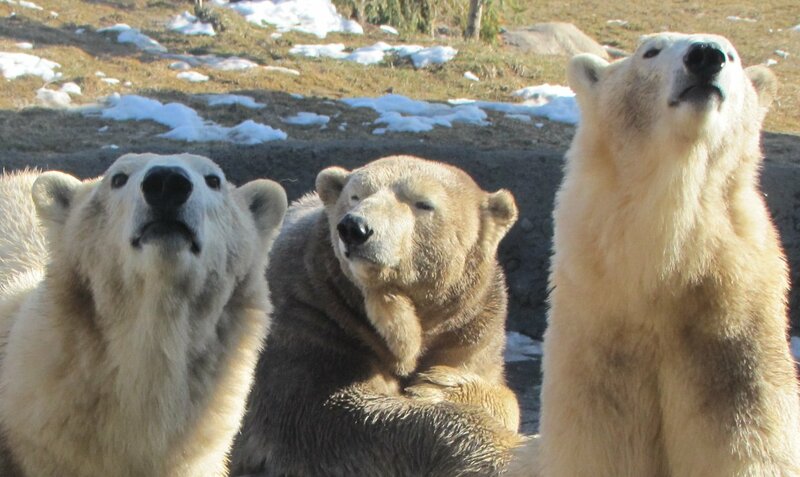 Im letzten November nun bekamen sowohl Anana als auch Aurora Nachwuchs, somit gibt es nun drei Jungtiere im Columbus Zoo, die einzigen Jungtiere , die im letzten Jahr in Nordamerika zur Welt kamen. who will probably be named Amelia (in the naming contest). 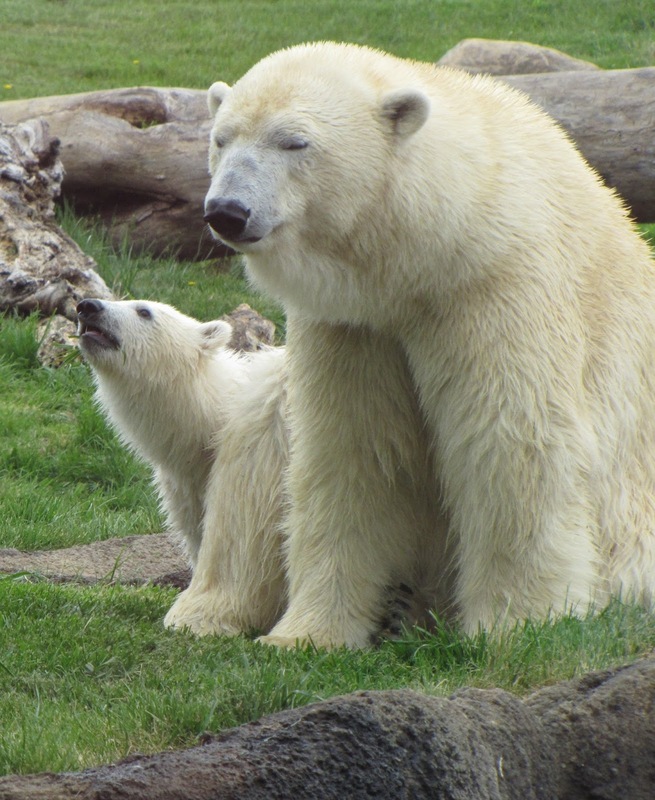 Aurora and Nanuq's son and daughter, no names yet. 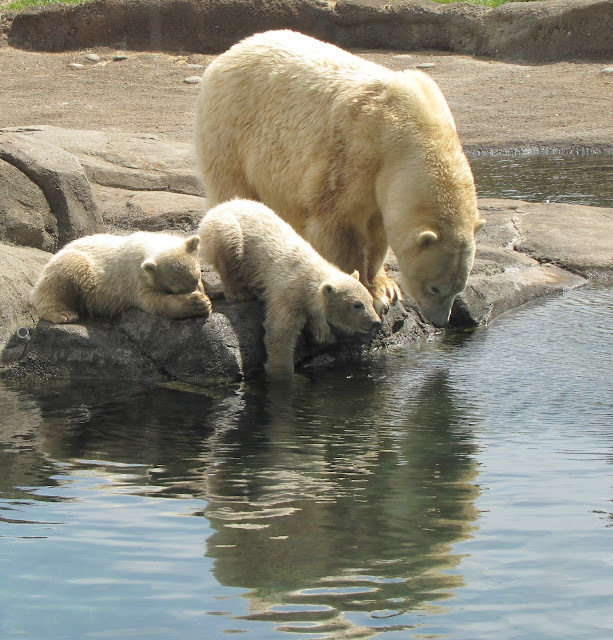 Nanuq is gone now, after living a very long life for a polar bear, and he leaves a legacy of five cubs, carrying his wild-born genes. He was a gentle giant, and we remember him fondly. Er ist nun von uns gegangen, nach einem für einen Eisbären recht langem Leben, und er hinterlässt fünf Nachkommen, die seine in der Wildnis geborenen Gene in sich tragen. Er war ein sehr sanfter Riese und wir werden uns liebevoll an ihn ereinnern. 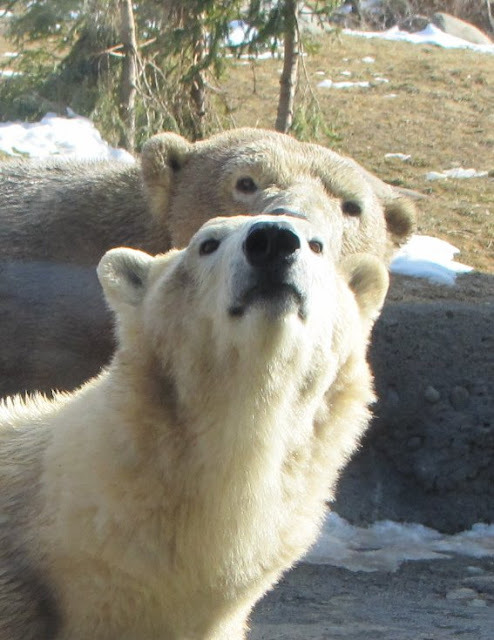 Nanuq could be a goofy guy too. Nanuq liked to roll in the dirt and be a brown bear. He also often rolled in the grass and became a green bear. 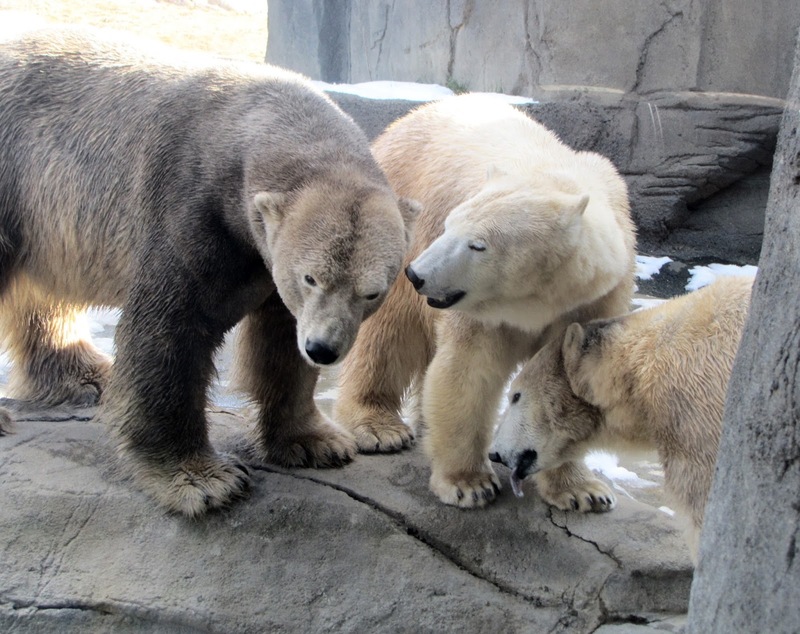 The twin sisters loved Nanuq. 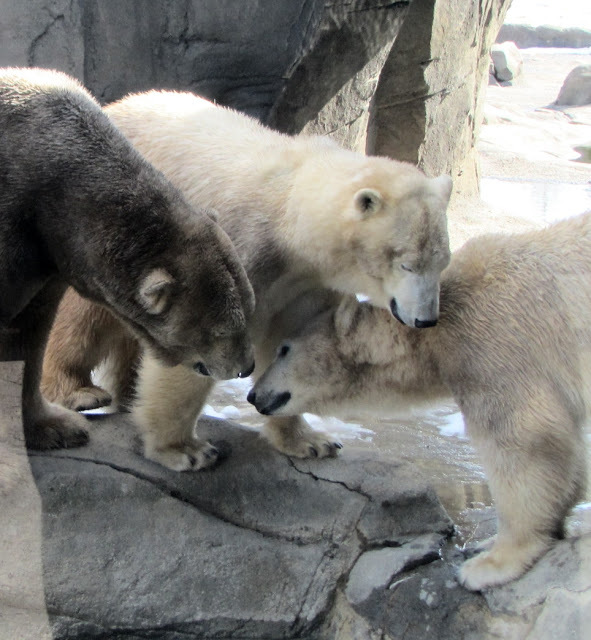 There was real affection between the three bears at the Columbus Zoo. 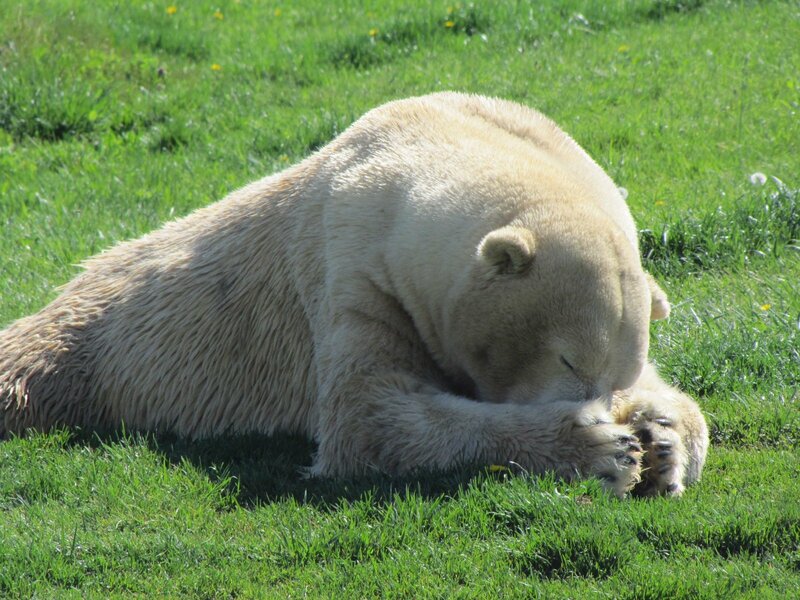 And again we have to grieve over the loss of another fantastic polar bear, the wonderful, handsome Nanuq. 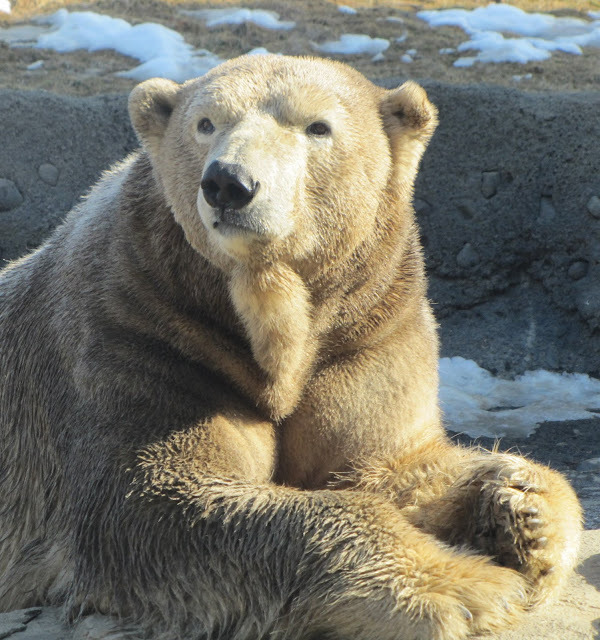 He was an extraordinary bear, living in a group with two fine girls, Anana and Aurora, and they got along just fine. I'm very sad about Nanuq's loss, but he will live on in his children. Sleep well, good bear Nanuq.